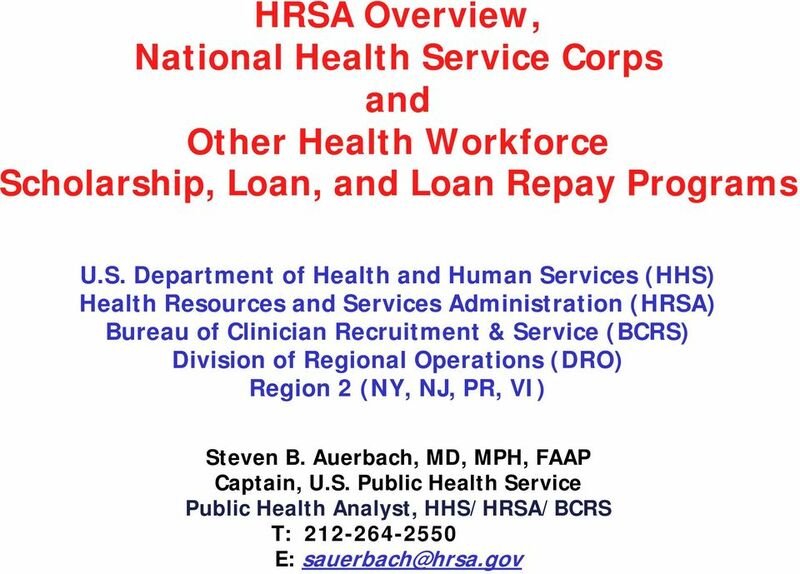 Download "HRSA Overview, National Health Service Corps and Other Health Workforce Scholarship, Loan, and Loan Repay Programs"
3 Loan Programs Loans for Disadvantaged Students: Need-based, competitive program. 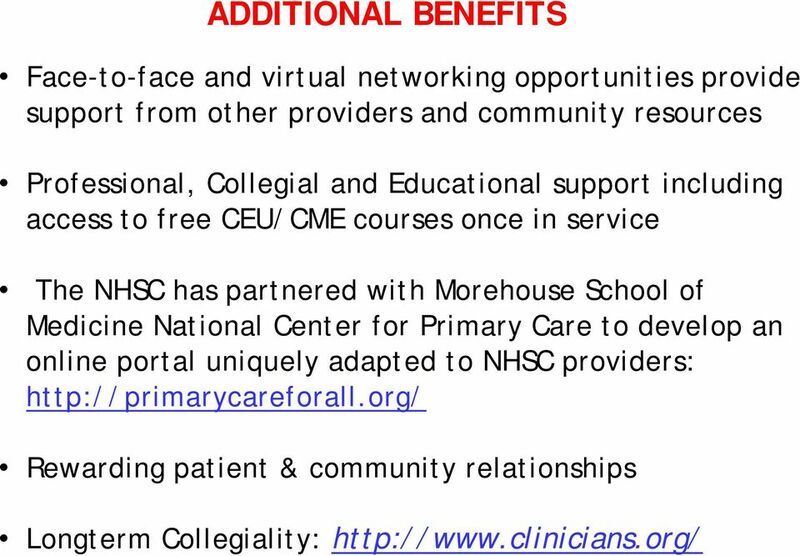 Must be enrolled in and apply for aid to participating school of: allopathic, osteopathic, podiatric, veterinary, dentistry, optometry, pharmacy. 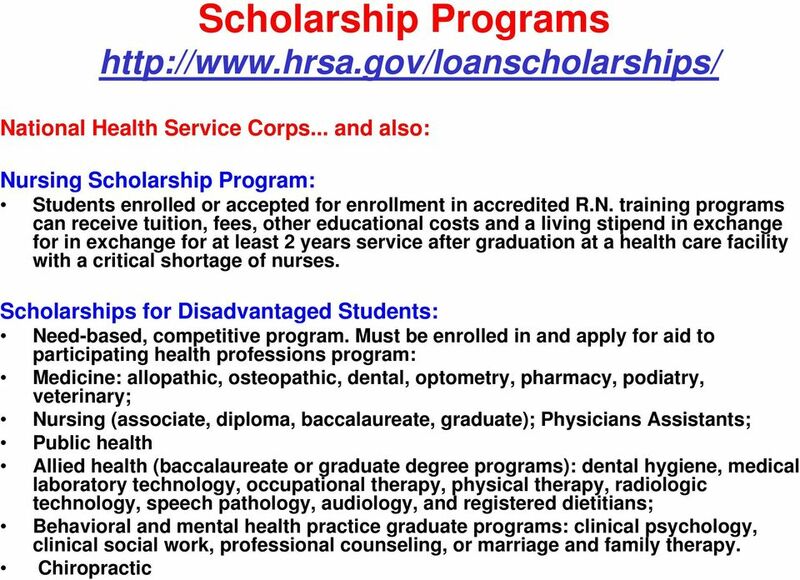 Health Professions Student Loans: Need-based, competitive program. Must apply for aid to participating school and pursue degree in: dentistry, optometry, pharmacy, or podiatric or veterinary medicine. 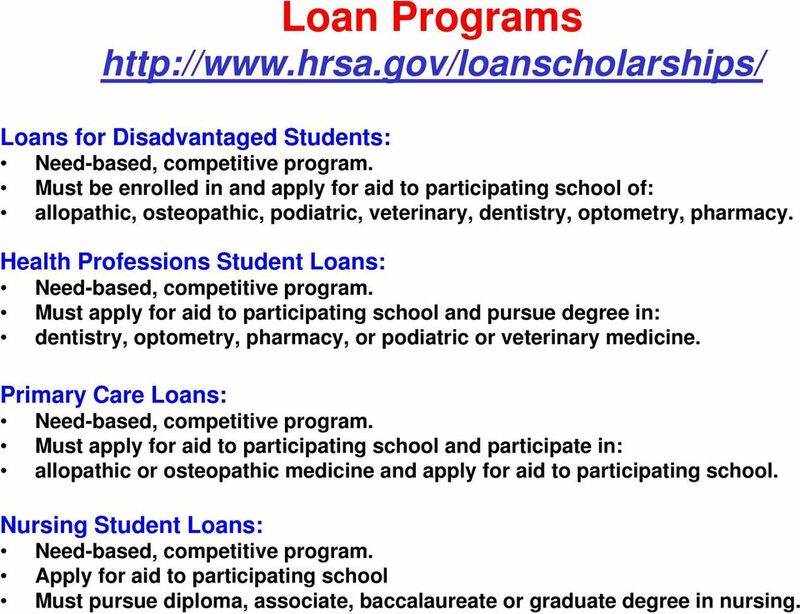 Primary Care Loans: Need-based, competitive program. Must apply for aid to participating school and participate in: allopathic or osteopathic medicine and apply for aid to participating school. 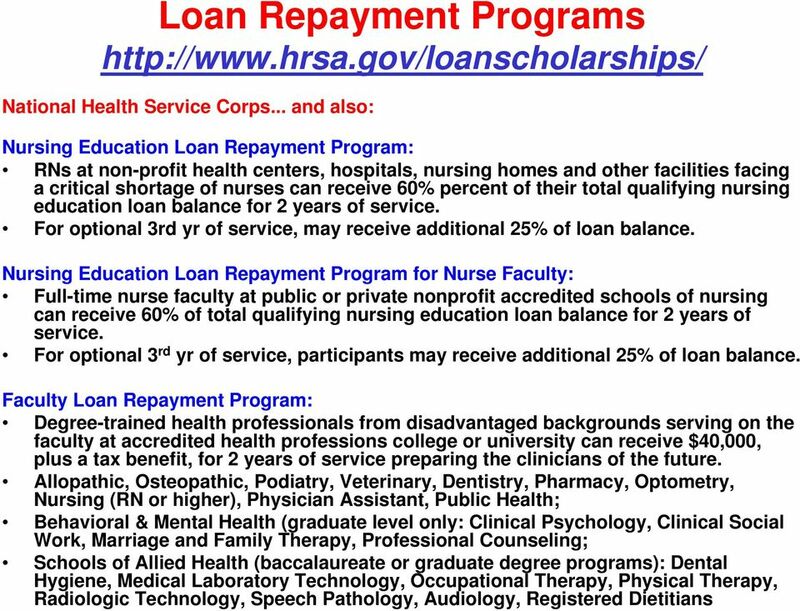 Nursing Student Loans: Need-based, competitive program. 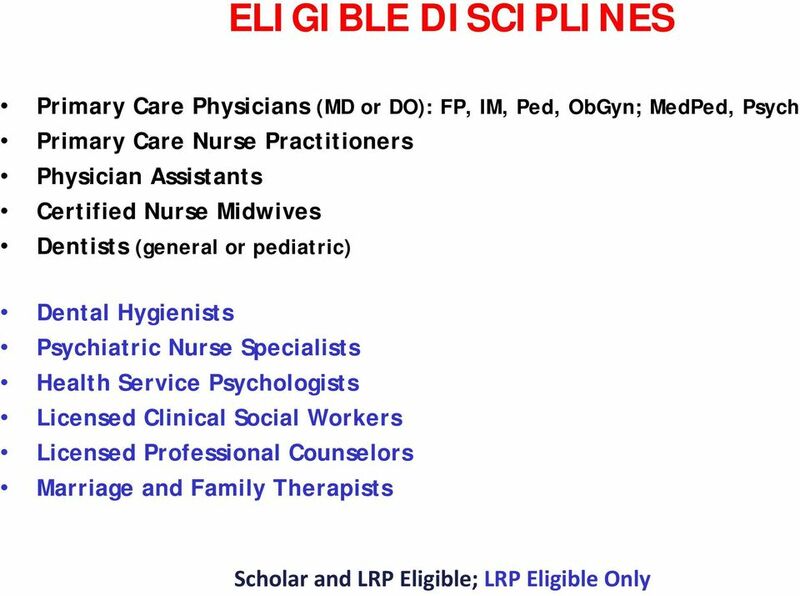 Apply for aid to participating school Must pursue diploma, associate, baccalaureate or graduate degree in nursing. 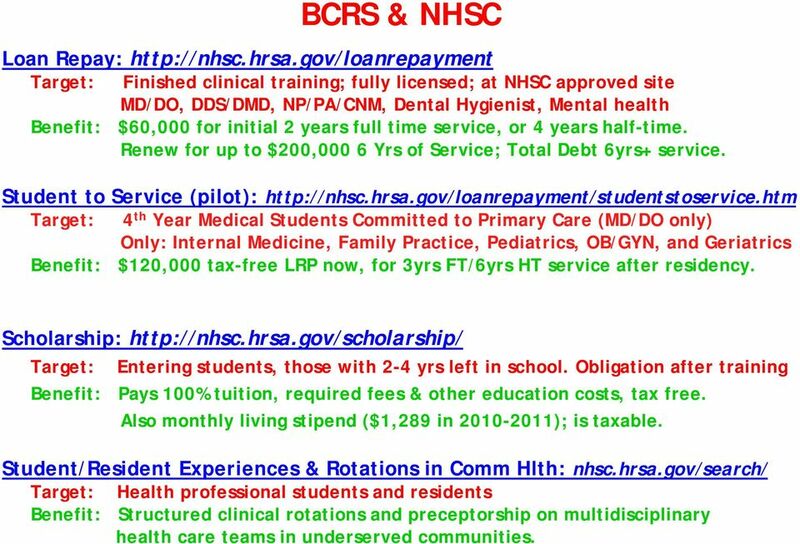 6 BCRS & NHSC Loan Repay: Target: Finished clinical training; fully licensed; at NHSC approved site MD/DO, DDS/DMD, NP/PA/CNM, Dental Hygienist, Mental health Benefit: $60,000 for initial 2 years full time service, or 4 years half-time. Renew for up to $200,000 6 Yrs of Service; Total Debt 6yrs+ service. Student to Service (pilot): Target: 4 th Year Medical Students Committed to Primary Care (MD/DO only) Only: Internal Medicine, Family Practice, Pediatrics, OB/GYN, and Geriatrics Benefit: $120,000 tax-free LRP now, for 3yrs FT/6yrs HT service after residency. Scholarship: Target: Entering students, those with 2-4 yrs left in school. Obligation after training Benefit: Pays 100% tuition, required fees & other education costs, tax free. Also monthly living stipend ($1,289 in ); is taxable. 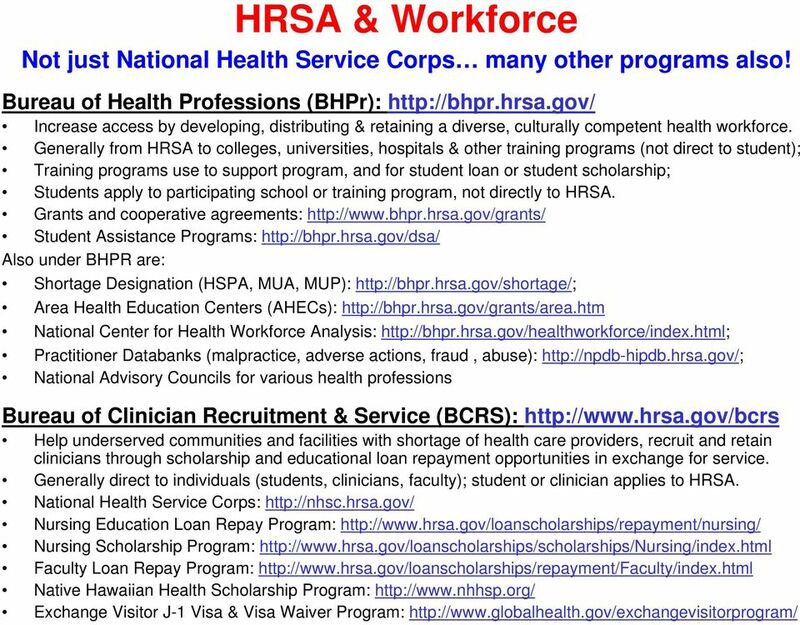 Student/Resident Experiences & Rotations in Comm Hlth: nhsc.hrsa.gov/search/ Target: Health professional students and residents Benefit: Structured clinical rotations and preceptorship on multidisciplinary health care teams in underserved communities. 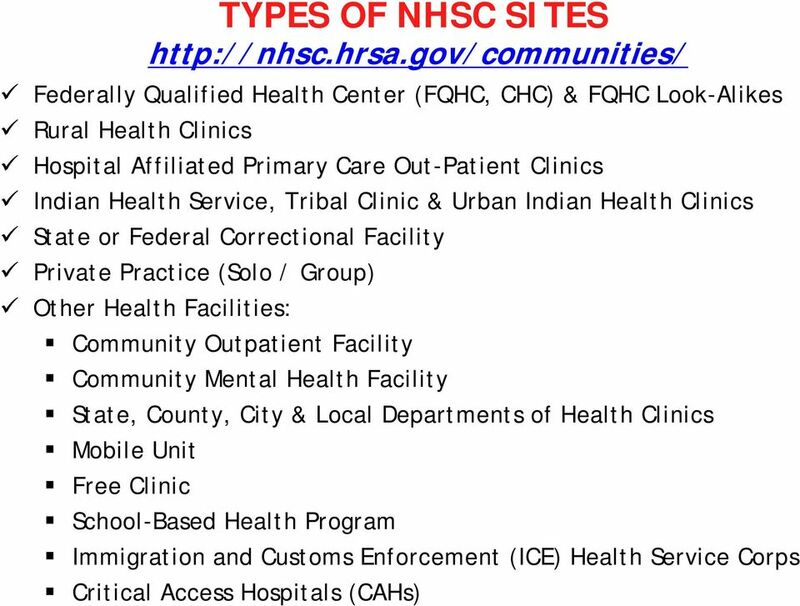 8 NHSC SITE REQUIREMENTS Provide comprehensive primary care services Medical, Dental and/or Mental and Behavioral health services. 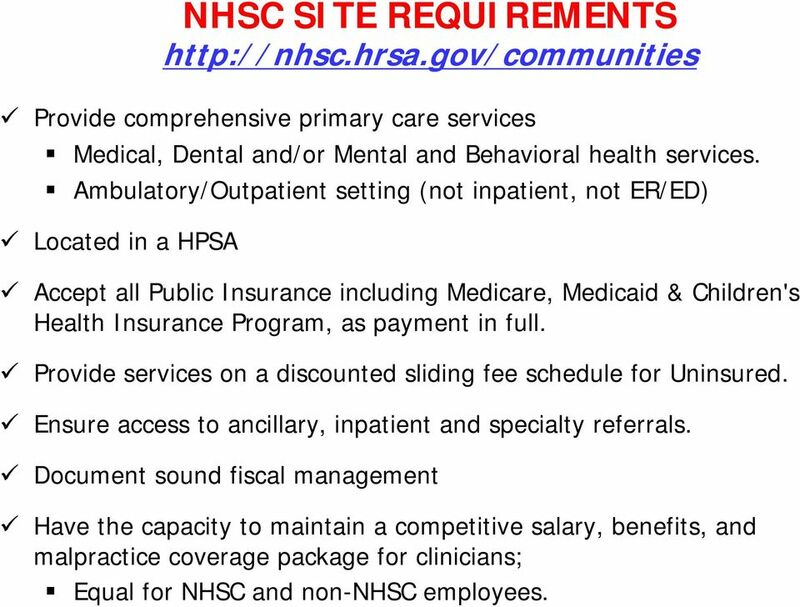 Ambulatory/Outpatient setting (not inpatient, not ER/ED) Located in a HPSA Accept all Public Insurance including Medicare, Medicaid & Children's Health Insurance Program, as payment in full. 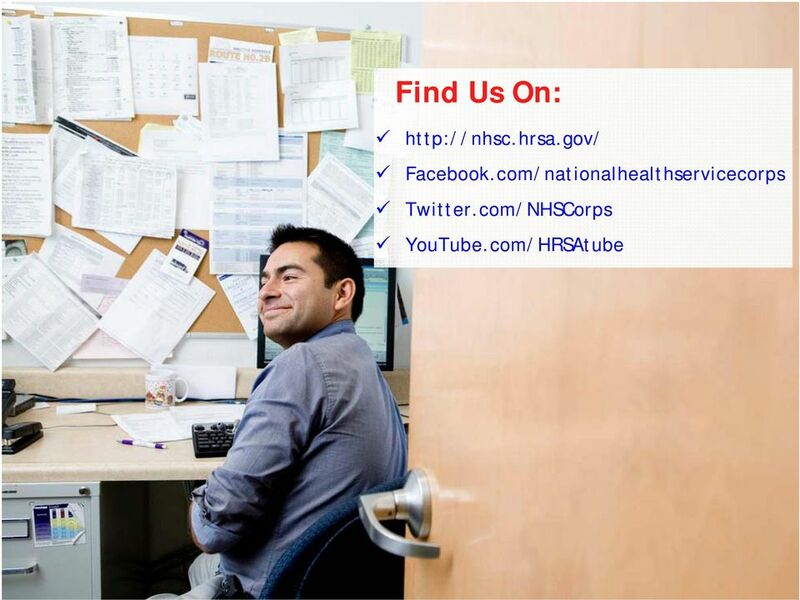 Provide services on a discounted sliding fee schedule for Uninsured. 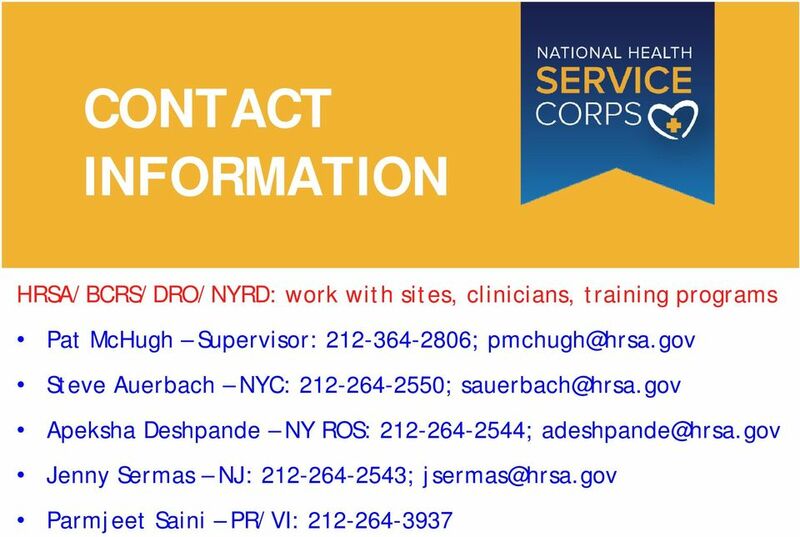 Ensure access to ancillary, inpatient and specialty referrals. 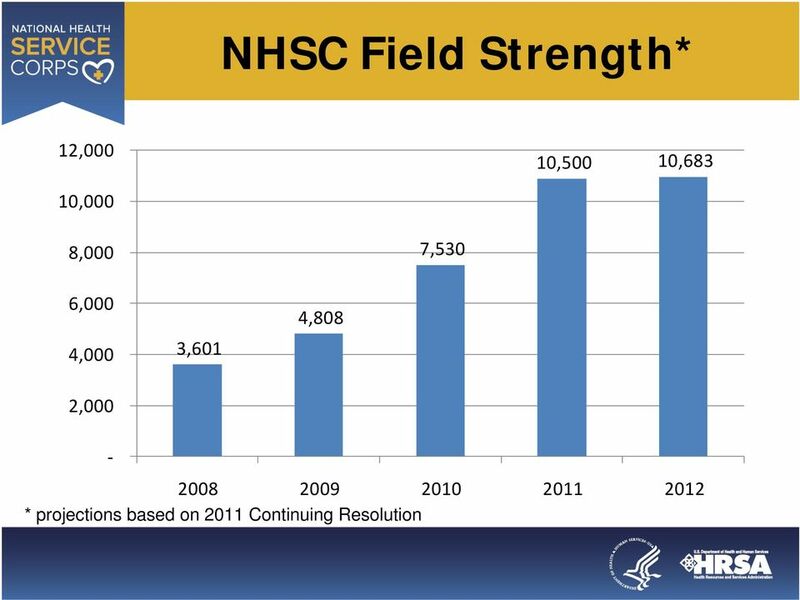 Document sound fiscal management Have the capacity to maintain a competitive salary, benefits, and malpractice coverage package for clinicians; Equal for NHSC and non-nhsc employees. VA Programs designed specifically to encourage medical professionals to work at rural VA s.
The Obama Administration s Record on Supporting the Nursing Workforce Nurses are at the center of the American health system. There are more nurses in our country than any other type of health care provider. 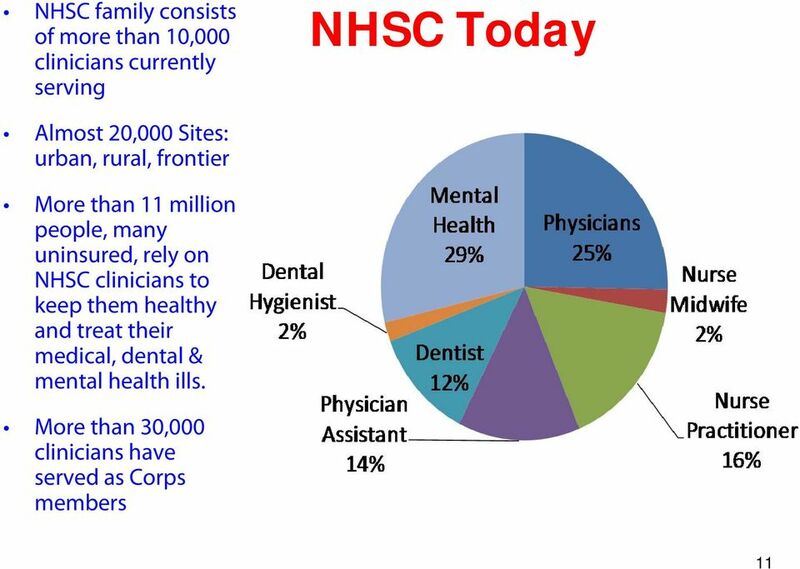 DENTAL CORPS A MORE DIVERSE PRACTICE THE TEAM APPROACH TO HEALTH CARE When you join the Army Health Care Team you become a member of one of the largest comprehensive health care systems in the country. Discretionary Funding in the Patient Protection and Affordable Care Act () C. Stephen Redhead, Coordinator Specialist in Health Policy Kirsten J. Colello Specialist in Health and Aging Policy Elayne J. General Notice for the Virginia Physician Loan Repayment Program The final regulation for implementing the Virginia Physician Loan Repayment Program (12VAC5 508) is in review in the Office of the Governor. 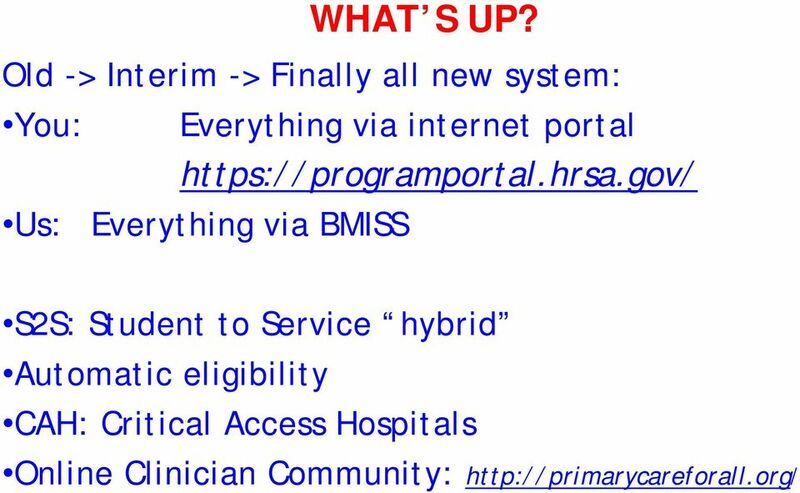 4123-6-02.2 Provider access to the HPP - provider credentialing criteria.